This year’s NISOD recipients are (l to r) Alicia Iola, Paula Richards, Attorney Judith Pollock-Ciampi, Dr.Patricia Machado, and Mark Clements, Ph.D. not in photo. 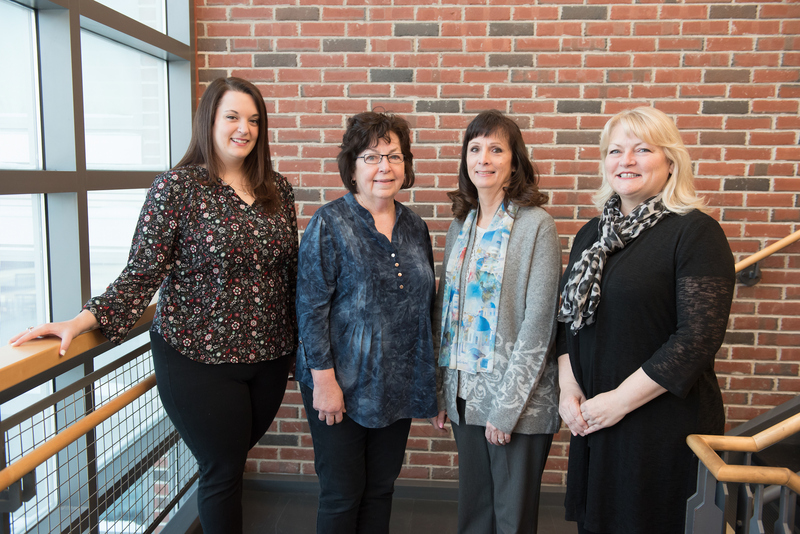 Five Northern Essex Community College faculty and staff members were recently named recipients of the National Institute for Staff and Organizational Development (NISOD) Awards for Excellence, a national honor that recognizes outstanding faculty and staff in the country’s community colleges. This year’s recipients include Alicia Iola of Bradford, administrative assistant in the International Studies, PK – 12 Partnerships & STEM Center; Mark Clements, Ph.D., of Wakefield, associate professor of biology; Paula Richards of Salisbury, associate professor of English as a Second Language and English; Dr. Patricia Machado of Dracut, professor of economics; and Attorney Judith Pollock Ciampi of Chelmsford, professor and faculty lead for the Center for Business & Accounting. Since 1978, NISOD has been dedicated to the professional development of faculty, administrators, and staff; and to the continued improvement of teaching and learning, with the ultimate goal of student success. He is an active researcher, publishing his work on a consistent basis. Data driven by nature, he has explored and discovered impressive data sets using the Zogotech program and thought of new ways to look at the data, wrote Knoepfler. Alicia Iola, who started at the college more than 10 years ago, has worked in a number of positions part and then full-time. She was also nominated by Knoepfler, who praised her for balancing a number of tasks. Dr. Patricia Machado, who has taught at Northern Essex for 11 years, was nominated by Judy Zubrow, dean of liberal arts. She praised Machado as both a skilled advisor and teacher. Judith Pollock-Ciampi, who started working at NECC in 1994 on a part-time basis, has held several positions including program coordinator, educator, and most recently innovator in the Center for Business & Accounting. She was nominated by Kelly Sullivan, dean of business and professional studies. She will continue to use her legal skills as she develops an online hospitality law class for the business: hospitality program. Paula Richards, who began teaching as an adjunct in 2000, was hired full time in 2008. She was nominated by Janice Rogers, associate dean of liberal arts. Colleagues Retired English Professor Paul Saint-Amand, Professor Rick Lizotte, Janel D’Agata-Lynch, coordinator of civic engagement, service-learning and community resources, and Amy Cameron, ESL curriculum coordinator, supported the nomination.